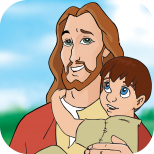 Miracles of Jesus is a Christian storybook app by NEST Family Apps. 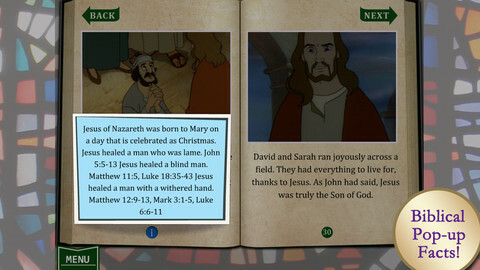 It puts several stories from the Gospel together in an accessible way for children of different ages and abilities. While I’m happy to have a Christian story app to share with my children, there are a lot of extra features in the app that I was pleased to see. It supportive of early readers, a great resource for educators, and entertaining for all ages. The developers have put a lot of thought into the design of this app and I really enjoyed reviewing it with my family. Levels of difficulty – Each of the three reading modes is available in two levels of difficulty: Early Readers – suitable for early primary, or Advanced Readers – suitable for middle primary and above. This mode also features pop-up information panels that give children more background information. If you use the Advanced mode in either the Read to Me or Read and Learn modes, you’ll find the Gospel Chapter and verse references in the pop up information panels. Supportive Text Features – Text is highlighted as read (except in Just a Book mode) and you can tap on individual words to hear them spoken. These features are very supportive of early readers. Good Narration – The narration by Dean Cooper is well paced, clear and expressive. His US accent was easy for my children to listen to, even if some of the words are pronounced slightly differently to the way they are pronounced in Australia. Discussion Starters – At the end of the story is the NEST family chat, which gives you a couple of questions to use as discussion starters as you reflect upon the story. Colourful Illustrations – The illustrations are clear and colourful, and they seem to come from stills from the NEST animated cartoon of the same name. Activities – The app comes with a number of extension activities. Word Jumble, Word Search and Maze activities each have two levels of difficulty. The Trivia activity consists of multiple choice questions about the story that are great for comprehension. There are no penalties for wrong answers, and children get to try again until they arrive at the correct answer. Children with reading difficulties might need an adult or older sibling to help them read the questions and possible answers, and I’d like to see an option added that reads the questions and answers to make them a little more accessible. While I love the way the alphabet and word tracing activities are done, I prefer my children to do writing activities that use the same font they are using in their handwriting at school. That being said, I think the word tracing activity will be very useful for vocabulary skills. Painting – There are more features to the painting activity than you might expect. I was impressed with the variety of paint tools (spray, brush, crayon, chalk or paint bucket,) the number of colour choices, and how easy it was to change the size of the painting tools. There are 6 line drawings from the story, plus a blank canvas for free-style art. The black lines in the drawing always stay on top, and painting “outside the lines” is impossible, making it easy for the most un-coordinated artist to create a masterpiece.We found it a little difficult to paint the lower parts of each screen as the colour options kept popping up over where we were painting. A hide/reveal tool option might address this problem. The YouTube video below (towards the end of this page) will give you an overview of the App and its features. There are external links to social media, the NEST website, and the iTunes Store in the Help section, however this is not easily accessible to very young children. You need to enter your birth year in order to access these links and other information. While I don’t believe young children will bypass this, if you have concerns about your children accidentally accessing the external links and social media, I suggest putting the app in Airplane mode or turning off WiFi before giving the device to your child. This app is a great resource for Christian families and schools. Apart from some wonderful stories from the Gospels of Mark, Matthew, Luke and John, the app has features that are supportive of early readers, plus some great activities to assist with comprehension. There is a lot of attention to detail, making this app useful for children of different ages and abilities and engaging enough for them to return to it frequently. I look forward to adding more NEST apps to our family collection. 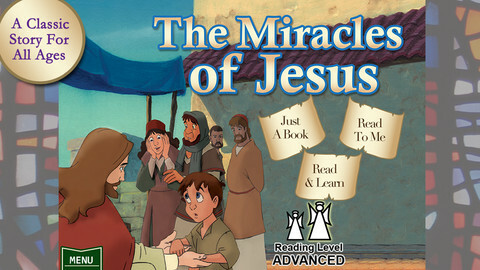 Miracles of Jesus is an enhanced storybook app from NEST Family Apps that shares with young and advanced readers the powerful stories of The Lord’s miracles and those who had faith in Him. This timeless story has been reimagined into an interactive app experience that brings to life the classic animation from the popular NEST Learning DVD series. This Biblically accurate telling of Jesus’ miracles reveals how having faith can make the world a better place. Though David cannot walk or talk, he smiles because he has faith that Jesus will heal him. People cannot believe their eyes when Jesus brings a little girl back to life. And the apostle Peter learns that faith can make the impossible possible when he walks across the water into the arms of his Savior. • Three Reading Modes: Read & Learn for children ready to interact with the text; Read to Me for children who want to be read to by a narrator; and Just a Book for quiet reading and reflection. • Bible-Based Teachings: Word Search, Word Jumble, Maze and Trivia games based on the story include two levels. A tracing activity encourages hands-on practice of letter recognition. • Coloring Pages: Kids can get creative while painting scenes taken directly from the story. • NEST Family Chat: Parents, caregivers and educators will appreciate questions at the end of the story, designed to prompt meaningful discussion.